Holy cow! It's tiny. Is that the cutest thing ever?! If you're a knitter with knitting friends - you know what to do. Get busy! 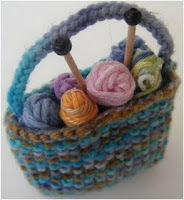 "This miniature knitting bag can be completed in an afternoon and makes an excellent ornament or gift for a knitting friend. It's also a great way to use up leftover sock yarn. Thank you so much for posting my pattern. My pleasure! Thanks so much for submitting it!